Proclamation No. 55 was signed by Philippine President Rodrigo Duterte on September 4, 2016, to officially declare a state of emergency in the Philippines in response to the 2016 Davao City bombing. Following the September 2 bombing in Davao City that killed 14 people and seriously wounded at least 60 others, President Duterte placed the entire country under a national state of emergency. By virtue of the proclamation declaring a "State of National Emergency on Account of Lawless Violence in Mindanao", the Armed Forces of the Philippines (AFP) and the Philippine National Police (PNP) were ordered to suppress all forms of lawless violence in Mindanao and to undertake measures to prevent violence from spreading to other parts of the Philippines. The proclamation also came on the heels of the Philippine military offensive against the terrorist group Abu Sayyaf in Patikul, Sulu which left 15 soldiers dead on August 29, 2016. It also acknowledged the threats of further terror attacks by lawless elements in other parts of the country, including the metropolitan areas, following these developments in Mindanao. President Duterte issued the proclamation in Manila just before leaving for Laos to attend the 2016 ASEAN Summit. Earlier, he verbally declared a "state of lawlessness" in the country on September 3, 2016. In a press conference in Davao the day following the attacks, Duterte said the declaration was to "ensure coordinated efforts" between the police and the military in the government's fight against illegal drugs, criminals and terrorism. He also said it was not a declaration of martial law and that the writ of habeas corpus will not be suspended. The presidential proclamation orders the Philippine law enforcement officials to carry out suppression of violence "as may be permitted in the Constitution and existing laws," as well as "with due regard to the fundamental civil and political rights of our citizens." It also states that the "state of national emergency on account of lawless violence shall remain in force and effect until lifted or withdrawn by the President." Under Memorandum Order No. 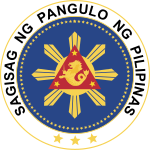 3 released on September 7, 2016, the Department of National Defense and the Department of the Interior and Local Government are ordered to deploy additional forces of the AFP and PNP in public areas throughout the country without causing undue alarm to the general public, and to intensify their local and transnational intelligence operations against individuals or groups suspected of, or responsible for, committing or conspiring to commit acts of lawless violence. It also orders the Department of Justice to coordinate with law enforcement agencies for the prompt investigation and prosecution of all suspected individuals or groups. (iv) when the person arrested, or to be arrested, has voluntarily waived his rights against warrantless arrests. The memorandum also lists the existing rules and procedures in carrying out warrantless searches and seizures, such as when the individual consents to the search or waives his right against warrantless search; when the search is made contemporaneous to a lawful arrest; the search of vessels and aircraft for violation of immigration and customs laws; the search of automobiles at borders for violation of immigration or smuggling laws; the seizure of objects made in plain view; stop-and-frisk situations; and searches arising from emergency circumstances. Any AFP/PNP personnel found violating any of the foregoing constitutional rights shall be held administratively and civilly/criminally liable therefor. ^ a b c "Proclamation No. 55, s. 2016". Official Gazette of the Republic of the Philippines. Retrieved 6 September 2016. ^ Solomon, F. (6 September 2016). "Rodrigo Duterte declares a state of emergency in the Philippines". Time. Retrieved 6 September 2016. ^ a b Ranada, P. (5 September 2016). "Duterte signs state of nat'l emergency proclamation". Rappler. Retrieved 6 September 2016. ^ a b Viray, P.L. (6 September 2016). "Palace issues proclamation of state of national emergency". The Philippine Star. Retrieved 6 September 2016. ^ a b Ranada, P.; Elemia, C.; Cupin, B. (3 September 2016). "Duterte declares state of lawlessness in PH". Rappler. Retrieved 6 September 2016. ^ a b c "Memorandum Order No. 3, s. 2016". Official Gazette of the Republic of the Philippines. Retrieved 18 September 2016.